It is estimated that in 2006 in Slovenia more than 65 million EUR of subsidies were allocated in the energy sector. Despite the fact that the use of fossil fuels is the most harmful to the environment, more than 68 % of aid was, directly or indirectly, intended for the use of fossil fuels; 91 % of these funds were intended for the use of coal. However, significant progress was made in the area of subsidizing and supporting mechanisms, primarily towards the support of measures for efficient use and renewable energy sources. Ministry of Finance, 2007; Ministry of the Environment and Spatial Planning, 2007; ELES, 2007. Slovenian energy policy that is defined in the Resolution on the National Energy Programme set specific objectives in the area of subsidizing, especially in the area of efficient use and renewable energy sources. 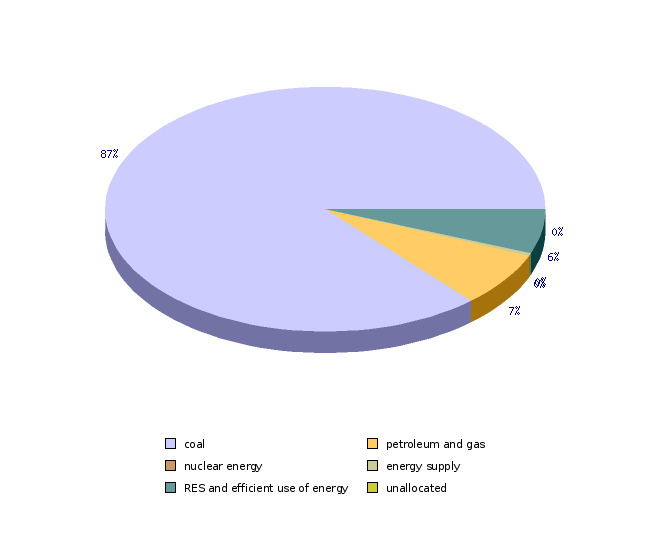 The National Energy Programme stipulates that, in the area of measures for efficient use and renewable energy sources and for supporting educational and promotional activities, the state should annually devote 58.42 million EUR, of which 33.8 million EUR are for the measures of efficient energy use and 16.27 million EUR for the promotion of renewable energy sources. In the area of subsidizing the use of coal, Decision 1407/2002/EC was adopted at the EU level, which permits the continuation of coal subsidizing until the end of 2010; the subsidies are supposed to be intended for restructuring of production with regard to social and regional aspects and provision of access to economically justified supplies of domestic coal as strategic reserves. On the basis of the available data for Slovenia, it is estimated that subsidies in the energy sector in 2006 amounted to 65.2 million EUR. 62.7 % of this amount was directly and indirectly intended for the use and extraction of coal and 31 % for efficient use and renewable energy sources. The remaining aid was intended for the use of other energy sources or it was not possible to specify the purpose of subsidizing. 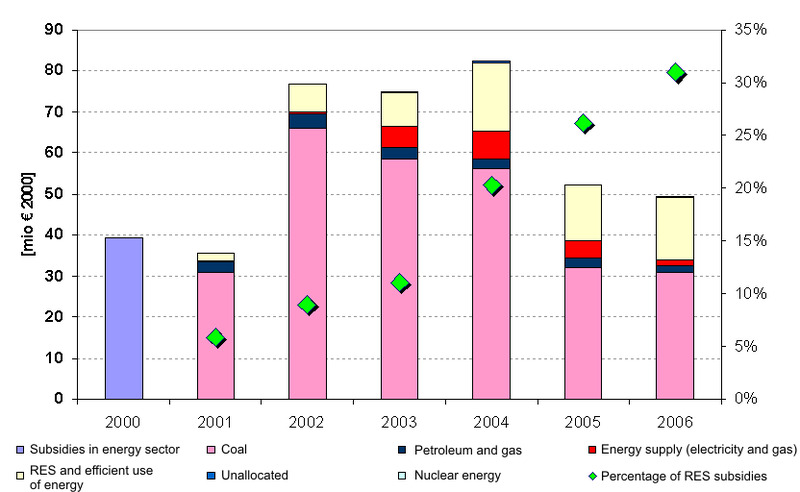 In Slovenia, the production and consumption of nuclear energy is not subsidized. The obtained data clearly indicate that subsidies in the energy sector have been decreasing in recent years. In 2006, 3.4 % less funds (in real terms, 5.4 %) were allocated by the state in comparison with 2005. The main reason for the decrease of subsidies are smaller payments in the area of priority dispatching of electricity from coal; moreover, less funds were also allocated to companies, the basic activity of which is the supply of electricity, natural gas and warm water. It is estimated that in 2006 €21.3 million of subsidies (32.7 %) were of an »on-budget« nature, which means that they were allocated from the state budget; the remaining €43.9 million (67.3 %) represent »off-budget« subsidies. In the area of »off-budget« subsidies, €40.8 million were allocated in the area of priority dispatching*, while the remaining €3 million mainly represent exemptions of tax payments and subsidized interest rates. In Slovenia, coal is still the most subsidized energy product. In 2006, €40.9 million of funds were allocated, of which €14.6 million was intended for the closure of the RTH coal mine and €26.3 million was paid to the companies Trbovlje thermal power plant and Ljubljana thermal power and heating plant for the priority dispatching of electricity. In the area of efficient use and renewable energy sources, €20.2 million of subsidies were allocated in 2006. Within the funds for efficient use and renewable energy sources, €13.3 million was paid out to qualified electricity producers (production from RES), €2.8 million was the estimated amount of state aid in the area of the subsidized interest rate of allocated loans, and €1.9 million of non-refundable funds was allocated for the measures of efficient use and renewable energy sources. €2 million was paid out (non-refundable funds and capital investments) for biomass district heating from foreign donations (GEF). In 2006, the share of subsidies intended for the promotion of efficient use and renewable energy sources increased to 30.1 %, which is 4 percentage points more than the previous year. The main reason is the increase in the number of allocated loans with a subsidized interest rate and increase in the payment to qualified electricity producers from RES. In 2006, a significant decrease of payments for priority dispatching can be noticed in the area of electricity subsidizing; namely, €3 million. In the area of financing of research and development in Slovenia, there was no typical increasing trend of funds that are intended for such research. In 2004, funds were, in comparison with 1996, by 52 % higher, whereby the amount of funds at the annual level significantly changed in the considered period. According to the amount of funds that were intended for research in the area of energy, the energy sector within the framework of the national development guideline does not represent a significant development area. 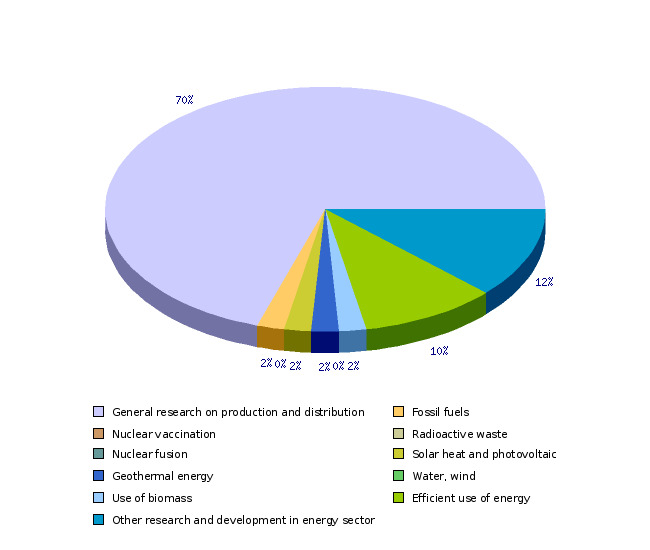 In the considered period, only 1 % of all funds were intended for research in the energy sector (see Figure EN22-4). 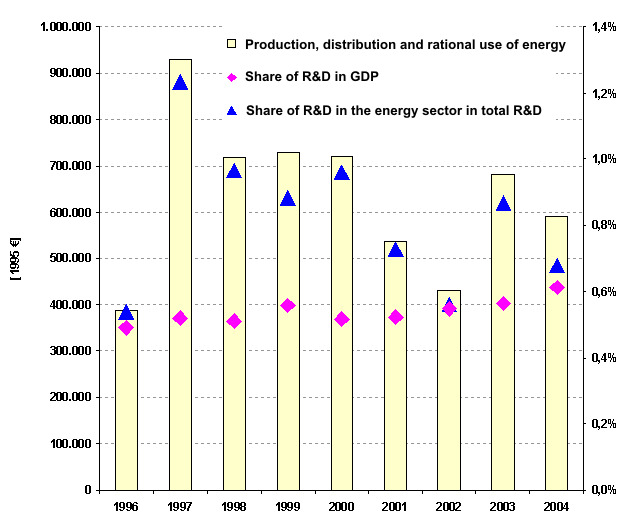 In 2004, €1.1 million of budget funds were intended for research and development in the energy sector. 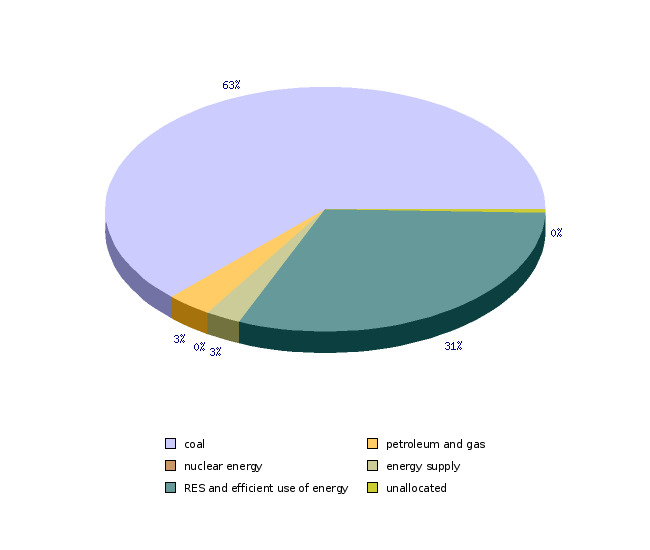 The majority of funds (70 %) were used for general research in the area of energy production and distribution, 8 % of funds were allocated for research in the area of renewable energy sources, 10 % in the area of efficient energy use and 12 % of funds were intended for other research in this area. * Priority dispatching includes funds for electricity production in Trbovlje thermal power plant, Ljubljana thermal power and heating plant and some smaller CHP power plants as well as funds for distribution (funds for distribution are intended for the financing of qualified electricity producers from RES).